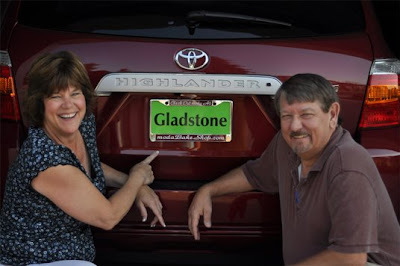 Bob had made Diane license plate holders with fun sayings. This one says check out moda at Moda Bake Shop.com. The car was loaded up and we started on our way to see some of the local “color”. I rode along to just a few of the stores. Man oh Man, I am so jealous after seeing the variety of stores in this area. 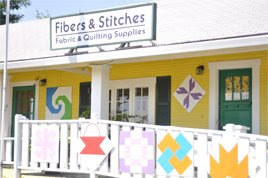 We stopped at Fibers & Stitches in St. Helen’s, Oregon. Just the outside of the building was enough to make you have to stop and see what is inside. 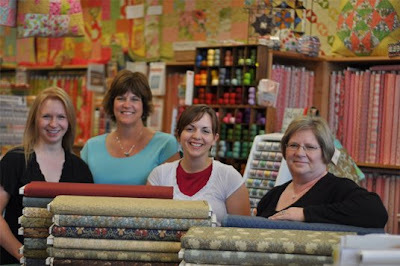 Quiltworks MW in Bellevue was a feast. Where Materials meet Inspiration…..
Full of the unusual and different. I couldn’t help but love their Moda Bake shop display table. The sign read, All you DESIRE self-serve dessert table. Too cute! They also stock a FULL range of beads and buttons. Too far for me to take some jewelry classes but I would if I could. trendy area. Apparel, kids things and a great variety or fabrics and patterns. 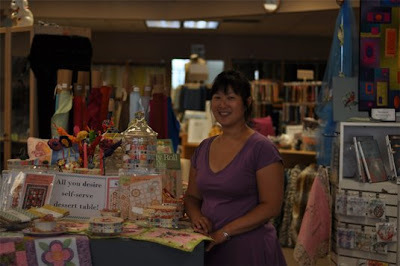 Angie also has machine quilting services and is very involved in charitable events. 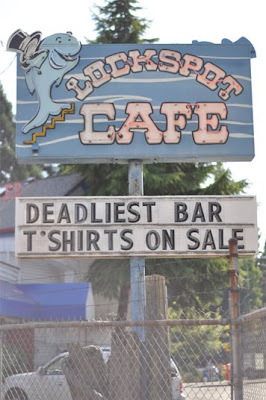 Stopped here for a drink and a T-shirt. 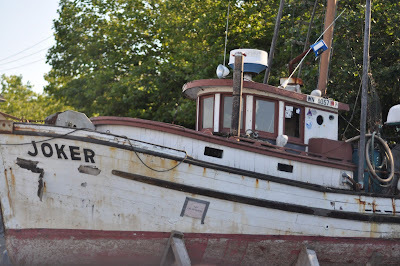 Found a boat for my husband or just a funny picture. 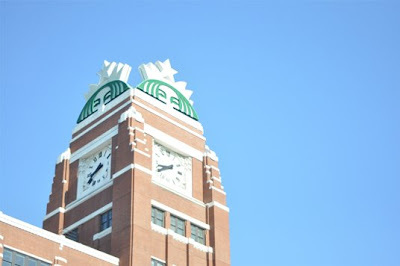 I had a coffee from the Starbucks headquarters. Saw the Amazon building also. the UPS man delivered moda’s William Morris collection during our visit. quilts featuring Joanna’s fabrics. And yes all you fig tree fans she does mail order! 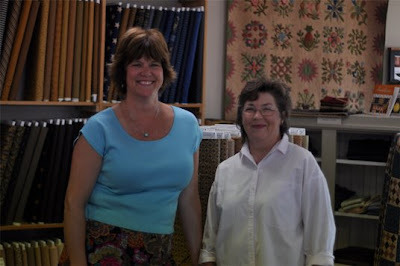 Momma Made It is a delightful shop specializing in reproduction fabrics in Longview, WA. If they do not have the reproduction fabric you are looking for it probably does not exist.Recognize Edyta’s (Laundry Basket) quilt in the background? Thanks to all the stores for making me feel at home and letting me shop! Tough, I know but someone had to do it. I drive a Highlander too… so I will fib and say that that's my car with the MBS plug! Ahem. Such great shops, especially Momma Made It (it's one of my hang-outs… and where I scare Sharon's customers away when my girl gang does a sewing day in her classroom). 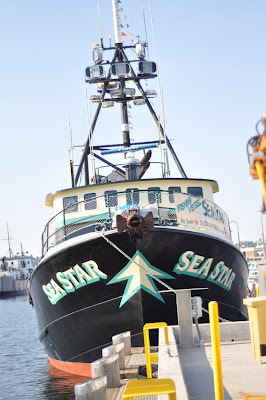 Though I have to point out… I was HUGLEY disappointed to discover that the Sea Star was an actual fishing vessel. 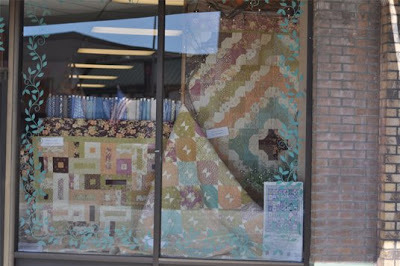 I thought for sure you were reporting a new quilt shop – a floating one! Images of the Hillstrand Brothers or Sig and Edgar cutting fabric… maybe a floating quilt shop's not such a good thing! i ♥ the figgy window. and monica's comment cracked me up. I think being a Moda rep would be a dream job! All that fabric, all those quilt store to visit. I HEART Oregon! Plans to move back one day. Ok…I LOVE Deadliest Catch. I watch it each season. Wow, how fun – thanks for posting our little corner of the country. I'm in Momma Made It land. 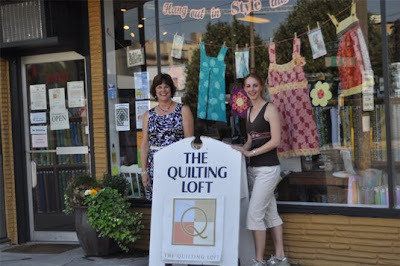 That's where I took my first quilt class – super gals. Sounds like so much fun! Those look like great shops, too. I'm in love with Edyta's quilt. She's amazing. And that Fig Tree window — beautiful! Sadly I didn't get to any quilt shops in Seattle or Washington. I DID get to B.C. I told the gals in Ketchikan to email pictures of their Moda display…maybe they will? They did have quite a bit of Moda. Well Darn, Why didn't Bob and Dianne bring you to Central Oregon! I would have treated you to lunch. (always the right thing to say after the fact. LOL). They're the best! Tell them hi from Anne (Sew Many Quilts and Bunnyhill Assist).